music | Making Food. Eating Food. things i love: chamber music, originally uploaded by iamchanelle. i attended a chamber music concert + art display this evening. it was pure delight. 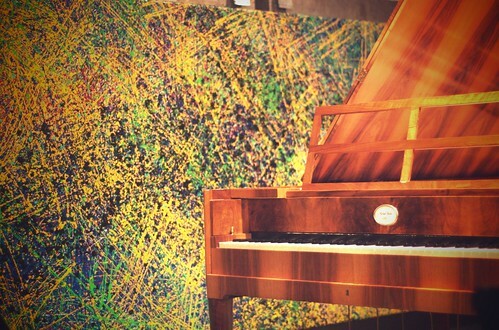 my friend kyle jordre had his beautiful artwork hanging all around The Icehouse, an incredible historic building in downtown phoenix, and a lovely concert was given in the midst of it – with this fortepiano, a violin, cello and classical guitar. there was even a sweet reception with wine and cheese, how grand is that? i was privileged to enjoy all of this with my huzband and the company of a dear friend, too! pure delight, i tell you. i hope your weekend has been sweet, too.